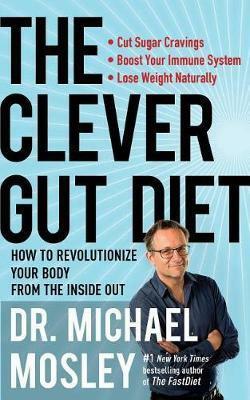 From #1 New York Times bestselling author of The FastDiet and The 8-Week Blood Sugar Diet, a groundbreaking book about your gut--the "second brain" of the body--and "the life-changing new plan that'll make you healthier, happier, and slimmer" (Daily Mail). Your gut is astonishingly clever. It contains millions of neurons and is home to the microbiome, an army of tiny organisms that influence your mood, your immune system, and even your appetite. In this groundbreaking book, Dr. Mosley takes us on a revelatory journey through the gut, showing how junk food and overuse of antibiotics have wiped out many "good" gut bacteria leading to a modern plague of allergies, food intolerances, and obesity. Drawing from the latest cutting-edge research, Dr. Mosley provides scientifically proven ways to control your cravings, boost your mood, and lose weight by feeding the "good" bacteria that keep you healthy and lean, while staving off "bad" bacteria that contribute to weight gain and disease. Dr. Mosley also shares a simple two-phase healing program, an effective way to repair and replenish the microbiome and to ease intestinal distress. Discover how foods like chocolate, red wine, and cheese can be part of a gut-healthy diet; how fasting can strengthen the gut and boost "good" bacteria; how changing your microbiome can undo the damage of yo-yo dieting; and how opening a window (and other simple acts) can improve gut health. Packed with delicious, healing recipes, meal plans, checklists, and helpful tips, The Clever Gut Diet includes all the tools you need to transform your gut and your health for the rest of your life.